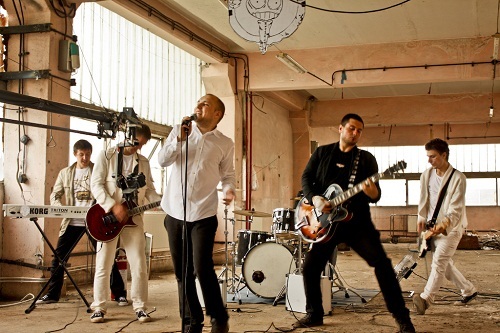 Romanian alternative rock band Grimus' song 'Nature Falls' has hit the top of the music charts on radios in the country, leading the pack of Romanian songs on Radio Guerilla. We feature the song in this week's RO song to give a little taste of Romanian rock that has the chance to be listened by a wider audience in the future. Listen to the album version and the acoustic version below. The band's name, inspired by the title of Salman Rushdie's first novel- Grimus is an approximate anagram of the word "Simurgh", a gigantic bird from Persian mythology. Started in 2005, Grimus signed an exclusive contract with the British publishing agency VT Music, based in Sheffield in 2009. Grimus' line-up is Bogdan Mezofi (Vocals, Valentin Rauca (Guitar), Cristian Csapo (Guitar), Lehel Kiss (Keyboard), Titus Vadan (Bass), Tamas Adorjani (Drums).